Police Sgt. Mickey O’Keefe laughed when actor Mark Wahlberg and director David O. Russell asked him to play himself in the critically acclaimed and Academy Award nominated film The Fighter. The real life mentor and trainer of both “Irish” Micky Ward and his brother Dickie Ecklund, O’Keefe agreed to audition after Wahlberg told him that as a cop you act every day on the job. He auditioned and got the part, a substantial one, in the film. Born and raised in Lowell, MA, the youngest child in an Irish Catholic family, O’Keefe was known all over the city before The Fighter came out. He has been on the police force for over 30 years, served in the military before that, and was a Golden Gloves champion in his younger days. 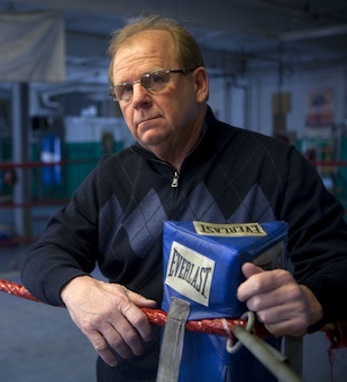 O’Keefe has known Ecklund and Ward since they were young children, training both – he was in Ecklund’s corner when he won a Silver Mittens Championship. He has a close relationship with Ward, thinks of him like a son, and fondly recalls training him. O’Keefe has not let this new-found fame go to his head: he considers family the biggest priority. His wife of 41 years, Donna, accompanied him to the premiere of The Fighter in December. He still is on the police force. And boxing is still an important part of his life.